Coming from 8 wins in the show tonight, Gujarat Fortune Giants in yet another match on their home ground would have wanted to keep the ball rolling in their favour. But with 3 losses to their name, UP Yoddhas were desperate to turn their fortunes. This would be a cracker of a match to watch indeed. Will UP Yoddhas be able to defeat the Fortune Giants at their home turf in Gujarat? Gujarat Fortune Giants – Sunil Kumar, Parvesh Bhainswal, Sachin, Dong Geon Lee, Ruturaj Koravi, Sachin Vittala, K. Prapanjan. UP Yoddha – Shrikant Jadhav, Nitesh Kumar, Jeeva kumar, Azad Singh, Narender, Rishank Devadiga, Sachin Kumar. Rohit Gulia, Mahendra Rajput and Shubham Palkar from Gujarat Fortune Giants. Bhanu Pratap Tomar and Vishal Chaudhary from UP Yoddha. Toss won by UP Yoddha and they chose the court. 5 minutes into the game and the Gujarat Fortune Giants had all guns blazing with back to back successful raids by Sachin and tackles by Parvesh Bhainswal, taking the score to 7-3 in their favour. The Giants tackled Rishank Devadiga leaving only 2 men on the court from the opposing side. Don Geon Lee, in the very next raid, took a touch point on Sachin Kumar and with the last man standing, Vishal Chaudhary getting tackled, UP Yoddha saw the 1st all-out of the night within the first 9 minutes of the game. Score, 12-4. After the Yoddhas returned from their 1st all-out, Rishank Devadiga was tackled yet again with a sprain in his left ankle. He was sent to the bench for the rest of the match. It was one-way traffic after that with Gujarat Fortune Giants all over the game. At 6 minutes remaining, Jeeva from UP Yoddha took a review on a successful tackle execution and saved a player of their team. With 3 minutes remaining before halftime, UP Yoddha started to show some nerve to fight a comeback in the game. 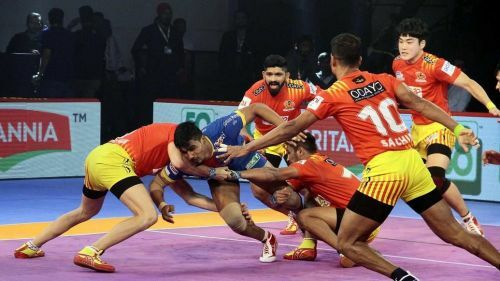 The UP defence started executing back to back tackles but Gujarat Fortune Giants were not ready to leave their 10-point lead as both Ruturaj and Parvesh Bhainswal, played their parts as the defenders for the home team. Sunil Kumar even got a green card for an aggressive touchpoint on a Yoddha. At halftime, however hard the Yoddhas tried to clear the hurdle, they were staggering by 9 points from the in-form home team with the scoreboard reading 19-10. With fire in their bellies, UP Yoddhas retaliated the Fortune Giants with a great comeback in the second half of the match. Just after halftime, Jeeva reviewed the very 1st successful raid executed by Shrikant Jadhav, in his favour, third successful review for the Yoddhas in a row. Shrikant Jadhav, dove right into the situation of the lurching Yoddhas and in a do-or-die raid smartly got rid of Parvesh Bhainswal, taking the scoreline to 20-14. In his next raid, he got rid of Ruturaj as well. The Yoddha defence was indeed back in action too. The entire team, as if, resounded for a game in their favour. With only 3 men remaining on the court from Gujarat Fortune Giants, the Yoddhas had a great chance of coming back in the game by inflicting an all-out on the home team. Shrikant Jadhav, the lead raider of UP Yoddha, in his very next do-or-die raid did inflict the 1st all-out of the night on the home team by taking away all the 3 men and scoring 5 points for the Yoddhas, coming to a 1-point lead. At this point, the game became very intense with both teams trading blows to take the lead. Meanwhile, Shrikant scored a Super-10. Nitesh Kumar followed with a High-5 for a successful Super tackle on the Fortune Giants, getting the score to 27-all from a 2-point difference. With only 1 minute remaining on the clock, at this crucial juncture, Gujarat Fortune Giants inflicted the 2ndall-out of the night on UP Yoddhas by tackling Shrikant Jadhav and coming back in lead. With 30 seconds remaining, the Gujarat Fortune Giants, sending out the message, loud and clear, played a rather powerful game with Mahindra Singh Rajput executing successful raids and Parvesh Bhainswal handling all the tackles down the wire bringing the score to 37-32, in favour of the Giants. What a resonant win by the Gujarat Fortune Giants! The Yoddhas must be hurting after losing this match which could’ve been in their favour had they kept their calm in the crucial moments. Gujarat continues to remain undefeated on their home turf.